It's Friday, gals - let's do this! 1) I confess that I'm only mildly obsessed with this little bauble of the week. Sigh...I think I need a second, third and fourth job just so I can purchase all these fun things I stumble upon. But seriously, on top of a gray, chunky knit sweater or cute LBD for the holidays? I think yes. 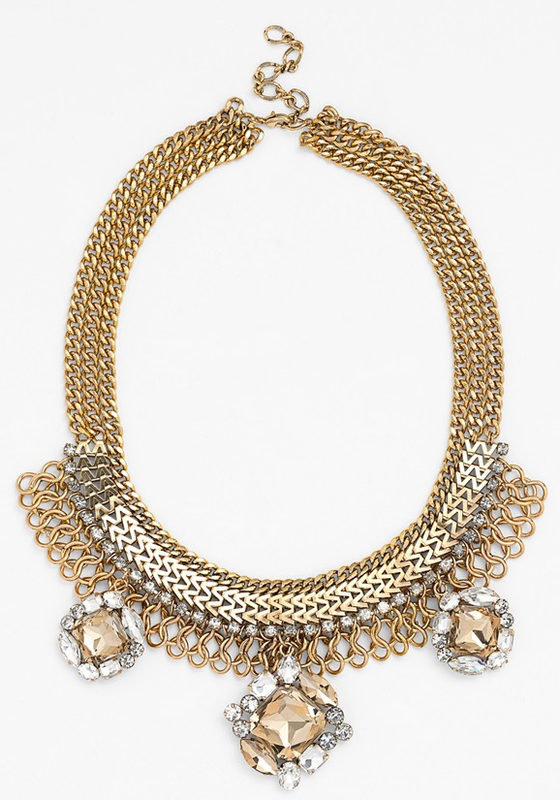 Crystal Cluster Necklace - currently on SALE for $34. You know, if you're like me and feel better about buying accessories if they're 'on sale'. 2) I confess that I want to throw a party in celebration of the end of the stinking political ads. November 4 has come and gone and I, for one, am relieved. Don't get me wrong, I'm a proud voter, but good grief. If I had to sit through one more 30-second commercial featuring another mudslinging windbag, my head might have exploded. I think no matter where our political views land, we can all come together to celebrate this. 3) I confess that people from Wisconsin might be the friendliest I've ever met. (That also might be the most random confession I've ever confessed.) You see, our subdivision is apparently a popular choice for transplanted Wisconsinites. (Wisconsinians?) (Peoples of Wisconsin?) Anywhoodle, our neighbors across the street are from Wisconsin, as well as the family that just moved into the new house next door. And I'm telling you, I LOVE THEM. Seriously. The mom next door offered to keep Caroline while I worked on the nursery and the ones across the street brought us the most amazing bratwurst the weekend we moved in. Anyway, just felt like I needed to commend the state of Wisconsin for producing such nice people. 4) I confess that I just cannot get on board with the word preggers, as in "one who is with child". It irks me, but I have no idea why. Like, when I hear someone say, "hey, preggers", it makes me cringe a little. (I had this exact conversation with a fellow expectant momma just this week!) Doesn't offend me at all, I just can't bring myself to say it. Do you have any words or terminology that bother you like that? Eww I hate the word custard too! I didn't mind the phrase "preggers" until you just pointed it out! I think it sound a little odd as a noun. As for those political ads..they were the worst. The senate candidates here in NC spent millions and millions of dollars on them..I think it was one of the most expensive races in the nation, and I'm not even really sure they are effective. I don't care what awful things your opponent has done - inform me! Tell me what YOU are going to do! But even that would probably get old, too. In the final days leading up to the election, I don't think I even saw one regular commercial. That word starting with M that you mentioned...I can't even bring myself to type it. I've made the mistake of telling people that I can't stand that word, so now I hear it a lot. It kind of makes me want to cry...ha! As a reader from Wisconsin, now living in KC, I couldn't agree more about Wisconsinites :) Everytime I go home I am reminded of how nice everyone is, ha! Anyway, love that necklace as well and will be putting it on my wish list. Love your blog, especially these confession posts!! I am also a reader from Wisconsin (but I identify as a southerner now. I fixed that asap). I am glad your neighbors are representing the state well! Such a great link up! Hope you have a wonderful weekend! I'm right there with you...preggers and prego always drove me nuts. But then again, pretty much every question got under my skin towards the end! First of all, I still just ADORE you. And secondly, that necklace = heart eyes. I'm so with you, I couldn't stand when anyone said "oh you're preggers" really, no I don't like that at all! I don't think anyone should be saying, "Hey Preggers," to anyone! I'm so glad to hear you that about your Sconnie neighbors!!!! I'm a Wisconsin girl through and through, and even after living in TN for 3 years, then NH for 3 years, I can without a doubt say that the people who think Wisconsin is a "fly over state" are definitely missing out on all the niceties of the Midwest! I have to agree with you about WI, my husband is from there and I loved visiting. The people are very nice and humble! I don't like prego either, I am not spaghetti sauce. Yeah, preggers kind of sounds redneck to me and I don't know why. Irksome for sure :). Have a great weekend! You made me laugh about the word preggers...I can't stand it! Sounds like a word a two year old would use. As for moist...I'm a nurse and often need to use that word or similar (ie: damp) and it pains me! It's funny how we dislike the same two words! The word juicy completely disgusts me. I could hardly type it. Ha!! One of my sorority sisters can't stand the word "moist" either!